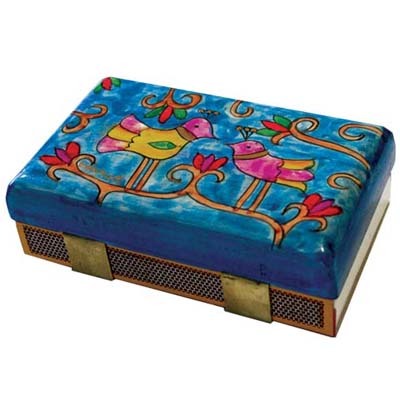 Birds Match Box – Kichen Size CAT# MBM - 2 . Match box holder with match box. Size: 4.5" X 2.5”. * Made and Shipped from the Holy Land * Approved by the strictest Kosher Jewish Authorities * Made by Israeli Artists * Best Price Product.All Bible Land Shop products come with a 30-day of MONEY BACK GUARANTED; (1) In case of a defect , please return the product and we will gladly replace it with an equally valued product you choose. (2) If you are not satisfied with your purchase, please return it and we will gladly replace it with an equally valued product you choose. (3) MONEY BACK IS GUARANTEED in any case of: * Unopened cosmetic and media (CD, DVD, software, or VHS tape) items. * Jewelry, books and clothing in new condition with original packaging and accessories. Doko Media's Bible Land Shop looks forward to serving you, your family and your community. The Doko Media Management.